1. They are intelligent. Bengals are mentally active cats that will eagerly engage in stimulating activities and playfully interact with people. 2. They must be active. Bengals are always on the move and love to play games. They love being walked on a leash, going on family outings, climbing and exploring. Anyone offering Bengal cats for sale will tell you that the Bengal breed is not for an owner who just wants a pretty cat to look at. You must be willing and able to provide plenty of outlets for exercise, even if it’s just a wide open space to play in. 3. They love taking cat naps. The Bengal cat personality is not much different from its domestic counterpart in that a Bengal will often sneak away to a quiet place for cat naps several times a day. Bengals are even known to snuggle with their owners when the mood strikes. 4. They demand attention and affection. 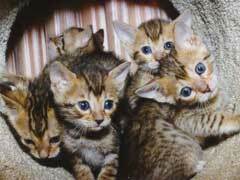 Bengals love being an integral part of the family and will seek out your love and affection. Now that you know more about the Bengal cat personality, it should be easy to see how a Bengal could fit into your family. Know the right questions to ask breeders and do your research. If you find a breeder with pregnant cats, you can even choose your new furry family member as soon as it’s born!